In its first major revision in more than a year, the Apache OpenOffice suite now comes with a sidebar, from which users can launch their favorite tools. “Over the years we saw the increased use of widescreen monitors, so we had to rethink how we used the user interface,” said Rob Weir, of the Apache OpenOffice Project Management Committee. The OpenOffice sidebar tackles the age-old problem of how to make a large number of its features easily available. As desktop applications tend to accrue more and more features, the sheer number of feature controls can be problematic in that users may have to hunt around to find them, if they are not available. Or users could become overwhelmed by all the new options, if they are all displayed at once. Microsoft confronted this problem when it replaced the standard menus in Microsoft Office 2007 with a rotating, context-sensitive ribbon interface, which would slide in the controls that would be most appropriate given the actions the user was currently taking, such as editing a text document. Unlike Microsoft’s solution, which placed the ribbon on top of the document being edited, OpenOffice places the menu choices onto the right-hand side of the screen. The move takes advantage of the copious increase of horizontal working space brought about by larger screens and higher screen resolutions that have become the norm in the past few years. The code base for the sidebar actually came from IBM’s short-lived Lotus Symphony office suite, which was a 2007 fork of OpenOffice that IBM contributed back to OpenOffice in 2012. OpenOffice 4.0 is the first major update of the open-source office suite since the IBM code contribution—OpenOffice 3.4 was released in May 2012. Sets of controls are grouped into 22 different panels, which can be expanded or collapsed as needed. 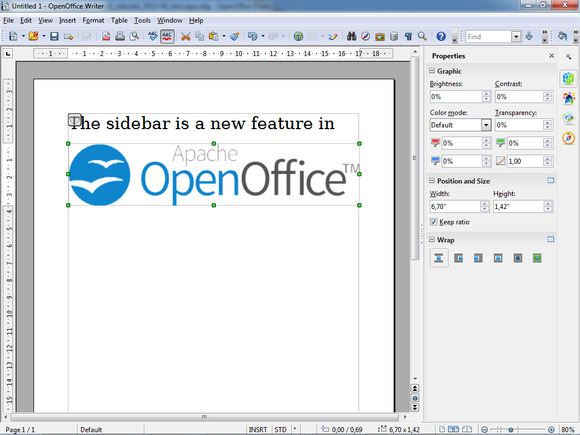 In addition to offering built-in panels, OpenOffice also allows third-party developers to add into the sidebar controls to their own extensions. ASF has set up a repository where users can peruse and download third-party extensions. Other new features of OpenOffice 4.0 include additional improvements in rendering Microsoft Office documents accurately, a new color palette (also drawn from Lotus Symphony) and support for three additional languages—Greek, Portuguese and Tamil. The nonprofit Apache Software Foundation (ASF) oversees nearly 150 open-source projects, including OpenOffice, the Hadoop data processing platform, the Cassandra NoSQL data store and the Apache Web server software. More than 58 million copies of Apache OpenOffice 3.4 have been downloaded since its release in May 2012, according to the nonprofit organization.